Hi Guys, We are trying to provide best deals for you. Hope You are enjoying our free recharge tricks and Paytm earning tricks .OnePlus The Wellknown Flagship Killer Brand Is Again Comes Back With new Contest “OnePlus Best SmartPhones Contest Of Rs.1 Crore” After The OnePlus December flash sale, they are back with another amazing contest to win 1 Crore rupees, Amazon Gift Vouchers & OnePlus 3T Smartphones . 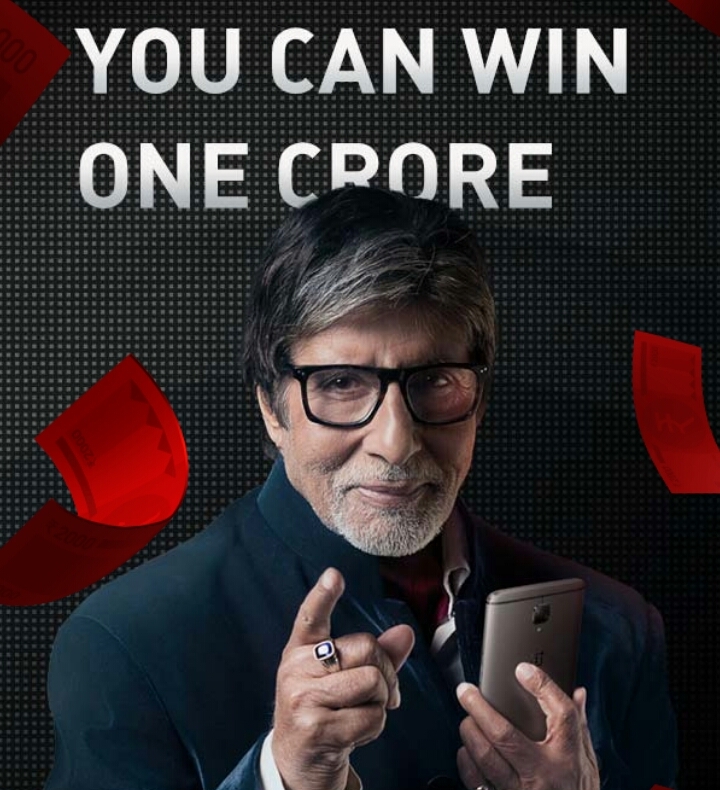 OnePlus Has Recently Partnered With Mr.Amitab Bachan and They Are Now Promoting This Partenership With “OnePlus Best SmartPhones” Contest Of Best SmartPhone . Winners Will Get Many Prizes Including The OnePlus 3T SmartPhones , Amazon Free Vouchers Upto Rs.1000 , And Grand Prize of Rs.1 Crore From Amitabh Bacchan. We Will Add Full Guide To Join This Contest And Participate In The Contest To Win Free Amazon Gift Vouchers. ➡ 1200 points can redeem Rs. 2000 Amazon Gift Card or Lucky Draw Ticket. 8. Keep Sharing To Earn More & More Points !! – Sign up using your OnePlus account, answer the ‘best rated smartphone’ question and connect using your social media account in order to proceed with the contest. – You have to complete 6 tasks & New tasks added every Wednesday. Complete as many tasks as you can every week to earn points. -The maximum points you can earn on each individual weekly task is 200. -Redeem your points to get lucky draw ticket and participate in the lucky draw and be one of 10 finalists in the run to win the 5 golden tickets. -Redemption shop opens every Wednesday starting 30th March, 2017 and gift cards are up for grabs on first come first serve basis only. -In case of no reply or inability to participate in the final round from any of the 10 lucky draw winners, their entry will lapse and passed on to another user who will also be selected basis a random draw. – Winners of the lucky draw will then be inducted into the final round, details of which will be shared at a later stage. – 5 of these winners will get a golden ticket and meet Amitabh Bachchan for a chance to win Rs. 1 crore cash prize. The other finalists will win the OnePlus 3T. This is for educational purpose only, don’t miss use it..